Microsoft is developing an interesting new system the company believes could radically change the way visually impaired people navigate an urban environment. The new prototype technology doesn't have an official name yet, but Microsoft refers to it as 3D soundscape technology. The assistive technology relies on three components: a smartphone, a bone conductive headset that rests over the user's ears (see image at top), and Bluetooth beacons placed throughout the city or suburb. As the blind person walks around, the headset provides a clicking noise that guides the user in the right direction and not, say, veering off the curb and onto the street. The beacons generate the directional information for the clicks. At the same time, the smartphone is piping turn-by-turn directions and other information such as transit schedules and nearby places of interest into the headset. 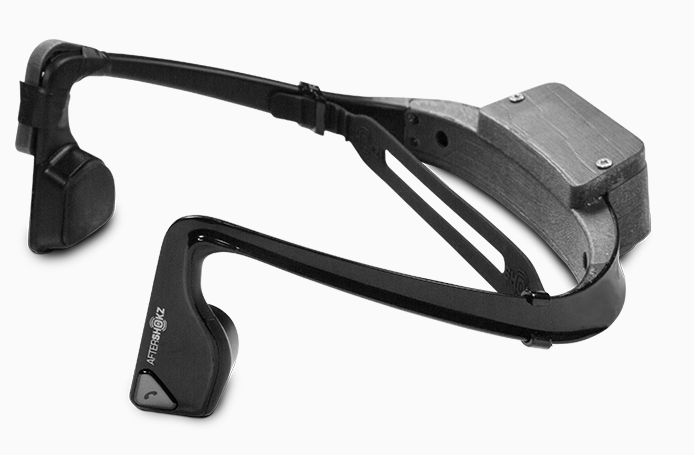 Since the headset doesn't plug up the user's ears, the visually impaired can still rely on their sense of hearing to speak with others and monitor the sounds of their environment. Why this matters: Around the world, nearly 250 million people are visually impaired, a full 65 percent of whom are unemployed due to their disability, according to statistics provided by Microsoft. The company hopes that its new technology can help visually impaired urban dwellers become more independent by making it easier to navigate an unfamiliar place alone. Microsoft also sees applications for this technology beyond the blind, such as self-guided tours at historical sites or even local guidance for receiving up-to-the-minute transit schedules, places of interest, and navigation. While Microsoft's new technology can assist the blind, it doesn't appear to be a replacement for time tested, widely used solutions such as guide dogs and canes. But Microsoft's 3D soundscape may still provide drastic improvements to daily life if adopted. The company believes the new tech can reduce the time it takes a blind person to learn a new walking route be it to work, a local café, or a shop on the other side of town. Microsoft is currently running a pilot project with the new soundscape technology in the U.K. There's no word on when Microsoft might start testing the system in the U.S. If you're interested to learn more about the new assistive tech, check out Microsoft's Independence Day story that details the new project at length. The Verge's Tom Warren also has an interesting hands-on with Microsoft's soundscape.